Thoughts of Lirael and Sam haunt his dreams, and he has come to realize that his destiny lies with them, in the Old Kingdom. But here in Ancelstierre, Nick faces an obstacle that is not entirely human, with a strange power that seems to come from Nicholas himself. 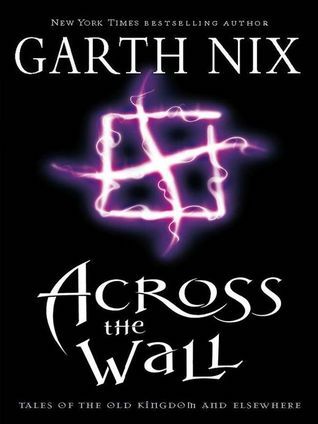 With Nicholas Sayre and the Creature in the Case Garth Nix continues to explore the magical world of the Abhorsen Trilogy. In additional short stories that range from two widely different takes on the Merlin myth to a gritty urban version of Hansel and Gretel and a heartbreaking story of children and war, Garth Nix displays the range and versatility that has made him one of today’s leading writers of fantasy for readers of all ages. ~Short Story Collections: I’m not usually a fan of short story collections, however Across The Wall was an enjoyable read. ~Misleading Blurb: From the blurb, I was under the impression that this would be a collection of short stories mostly centered around The Old Kingdom with a couple of miscellaneous short stories added. It turns out to be the other way around, the first and last short stories in the book are Old Kingdom related, but all the other short stories are mixed genres and are unrelated to each other. ~Author Notes: Garth Nix writes introductions for all of the short stories in the novel and I found it interesting to know the behind-the-scenes motivations for certain stories. So, even though I was a little disappointed with the lack there of Old Kingdom short stories and Across The Wall wasn’t what I would usually read, it was still enjoyable.